It's a long way to Yosemite Valley unless you take a more direct route than Miss Mary Palmer of San Francisco took today. Miss Palmer was one of a number of passengers occupying a Pullman from San Francisco on the night train. The Pullman was switched to the Y. V. train here and reached El Portal at the usual time, about 7:30 this morning. As the passengers disembarked they saw the down train standing near by, about ready to start for Merced, and as Miss Palmer supposed that was the train that was to take her on to Yosemite, she climbed aboard and made herself comfortable. After riding about three hours, Miss Palmer asked Conductor Monett how soon they would reach a station where she could get some breakfast. He replied that she should have had breakfast at El Portal, but she insisted the time was too short; that she had only time to get off one train and on the other. Then the light began to break in through Conductor Monett's cap, and he soon discovered the mistake Miss Palmer had made. Although his heart swelled with sympathy, he couldn't do anything for the young lady in the breakfast line; but he did the next best thing. He brought her to Merced so she could take a fresh start, which she did this afternoon. Let us hope and pray that Miss Mary will keep going in the right direction this time until she reaches Yosemite. With Trains in The Fountain City. A comedy of errors that sent one Yosemite Valley tourist out of Merced cursing the town and all its railroad intricacies one day this week, and is the cause of considerable comment and hilarity in railroad circles, though the name of the tourist is not divulged. It seems that the individual arrived in Merced from Yosemite Valley about 11 o'clock on the Y. V. train. He then went from the Yosemite Valley railroad's depot to that of the Santa Fe, and there purchased a ticket for San Francisco. He then proceeded to put in the time until train time by taking in the sights. Along in the afternoon he returned to the Santa Fe depot for about the time that the same train that had brought him down from the valley was backing into the yards to allow the passengers that had arrived on that time enroute to Yosemite to board. Not knowing that the Y. V. railroad had a spur running into the Santa Fe yards, the said tourist boarded the train and was soon on his way back to the wonderland with his San Francisco ticket. He did not discover his mistake until he was out of town a considerable distance and had been informed of the error by the conductor. The later very accommodatingly stopped the train and allowed his irate passenger to walk back to the fountain city. And to further add to his troubles the tourist, after hiking all the way back, found that in his hurry to leave the train he had neglected to take with him his suit case and other paraphernalia that he had deposited on the seat beside him when he went aboard. He then put in some time cursing the town and seeing the sights. El Portal to Merced, Aided by Hand Cars. The Crocker party which went to the Yosemite Valley a week ago in the special car Mishawaka, returned yesterday via the handcar route, leaving their special car at El Portal, where it will remain for some days, owing to the condition of the road in the Merced canyon. The party left El Portal yesterday morning at 7 o’clock, riding on handcars and push cars and walking over slides, arriving at Bagby at noon, where they took lunch. The same performance was repeated in the afternoon, the party being met near Pleasant Valley by the Yosemite Valley railroad motor car, which brought them into Merced, arriving here at 6 o’clock. Dinner was had at the Harvey house. The party was composed of Miss Jennie Crocker, Mrs. W. T. Scott, Jr., Mrs. McNear, W. H. Taylor, Jr., and six others whose names have not been learned. The party was happy when it reached Merced, all declaring that the novelty of the trip down the canyon was one that would never be forgotten. At the Harvey house the party was in high spirits, the ladies especially appreciating the outing. The party left Merced via the Santa Fe for San Francisco at midnight. Happening down the street the other day we struck Bill White and Tennessee Sparks holding a confab about railroading. For the benefit of the new settlers who are coming into Merced in such numbers we'll say that reference is here made to General Manager W. L. White of the Yosemite Valley railroad and District Freight and Passenger Agent I. T. Sparks of the Southern Pacific. They were talking the railroad lingo and evidently arranging some train schedule. One said why not high ball her through and dead head her back? We got in close, thinking we might tip Sheriff Billy White off to some murder about to be committed. However, the thing came out peaceable like. We asked 'em why they couldn't speak the United States language, and it reminded Bill of this story: * * * A brakeman was on the witness stand in a case involving damages resulting from a freight wreck. He was asked by counsel to just tell in his own words what happened when the rear end collision occurred. The head brakeman then proceeded: "Well, you see, the hoghead was on the ground greasing the pig; the tallowpot was on top breaking up diamonds; the Captain was in the doghouse sorting tissue; the rear shack was putting a keeley on a red hub, and I was up ahead bending a rail." Here's the interpretation: "The engineer was on the ground oiling the locomotive; the fireman was breaking up coal; the conductor was in the caboose reading orders, the rear brakeman was cooling a hot box, and I was up ahead closing a switch." Merced Sun O’Brien Fell From Everlasting Fame James H. O’Brien, contracting builder of the Associated Pipe line, was a visitor to Fresno during the past two days, says the Fresno Republican. For the benefit of those who are not acquainted with the irrepressible James H. it may be stated that at one time he was noted as the leader of the Horses and Carts faction in San Francisco and as such was a political power to be reckoned with in the municipal affairs of the coast metropolis. Later he added to his fame by building the railroad into the Yosemite Valley. James H. O’Brien furthermore asserts that but for the jealousy of an army officer of Uncle San his name would have been handed down to posterity as have been those of William Shakespeare and Napoleon Bonaparte and a few others. Here is the story of the reason why the name O’Brien, so far as James H. is concerned, will be a thing of the past 5000 years or so from the present time. During the period that O’Brien was constructing the Yosemite railroad he endeared himself to the several thousand men in his employ to such an extent that there was absolutely nothing too good for the boss. It would have been as much as a person’s life was worth for any one to have invaded one of the workingmen’s camps and have uttered anything against James H. O’Brien. After the road had been completed and the men were engaged in constructing the wagon road leading into the Valley proper, some of the laborers conceived the idea of doing something for their employer that would be appreciated. 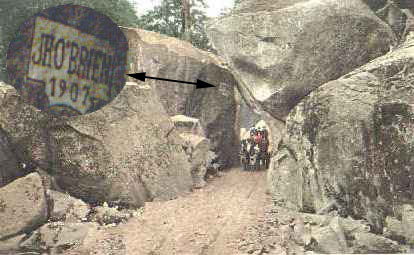 The opportunity presented itself when a monster granite rock was encountered along the path of the wagon road. This rock completely shut off further progress and as the road was being blasted along a cliff hundreds of feet high on one side and with the Merced river thundering along a few hundred feet below on the other, there was nothing to do but to drill a roadway through the rock. By dint of hard labor after some days this work was completed. It was then that the inspiration came. Among the workmen was a stone mason, who upon the suggestion of his fellow laborers, mounted to the top of the entrance of the tunnel, and there inscribed the name of "James H. O’Brien" in the solid rock, where it stood out in bold relief to the view of all incoming visitors to the Valley. The work was seen and approved by O’Brien, who swelled with pride at the idea that his name would remain on the granite for years to come as a monument to his achievement. All was well until one day an officer of the detachment in the Valley happened to be traveling along the road and allowed his gaze to rest upon that name. "Gadzooks," he said, or words to that effect, "who may this plebeian be who so dares to defile the works of nature?" An investigation by the military authorities led to the discovery that O’Brien was a mere civilian. About the next thing that happened was the application of a stick of dynamite to the entrance of that tunnel. The name of James H. O’Brien, though somewhat shattered, went higher than even its ambitious owner had ever hoped for in his wildest dreams. 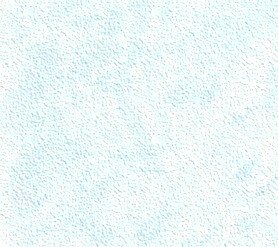 Particles of the letters rained on the mountain sides and also splashed gently into the river. It was a cruel blow to O’Brien. All his hopes for immortality vanished with the explosion. But an O’Brien will not accept a setback as permanent. Now that he is engaged in building the Associated Pipe line fresh hopes have grown in his expansive breast. Perhaps there may be an artist among his workmen who may paint in oils. And if there is O’Brien can rest assured that there will be no jealous army officer on hand to deprive him of any honors that may be coming his way. "A letter form the Smithsonian institution rquesting a YVRR engine as a relic of the early american history was read. Request was denied because said engine would not remain intact for such a long journey and the expense of crating same would be excessive. Brother White proffered a coach with seats along with the side as a substitute." "The YV may not be as long as other roads - but just as wide." William G. White, son of the general manager, and a friend went fishing in Moss Canyon: catch of the day 60 trout and 21 rattle snakes. The Sun's AP leased wire this morning for three hours was hot with inquiries and urgent demands for more information as to the "accident on Yosemite Valley railroad which killed five men and injured seven." Another query followed which raised the number of dead to an even dozen. They killed 'em all. The Sun hastily phoned Bill White to see how soon the funeral train would come out of the canyon with the bodies, and he said well, you're certainly first with the news; 1 haven't heard of it. And Sec'y Sargent gave us the same answer and Chester Welch, while admitting that it sounded good, said he hadn't been notified. Rolandi's camp at Starr reported that no word of the deadly blast had reached there, and the hospital at Exchequer run by Docs Lilley, Parker and Fountain said nobody had turned up there dead or injured and - well, the story just petered out. That's all. It finally developed that the rumor was circulated by someone while breakfasting in a Merced coffee shop. And we'll tell the wide, wide world that bird must have had some breakfast. Ken McSwain, a young engineer, with the Merced Irrigation District would frequently take a YVRR train to some point in the Merced canyon to make some hyrdo measurements on the river. The train crew would always stop at that point for McSwain to detrain and unload his heavy instruments. One time the crew failed to stop at the required point, but stopped further up the track. McSwain became very upset with the crew and demanded they back the train to the proper location - after an exchange of words the train crew compiled. Jean Parker was excited, Her brown eyes fairly danced as she remembered her reason for being in this day coach of the Yosemite Valley railroad. She was going at last, on her 29th birthday, to see wonderful majestic Yosemite. The year was 1908. She pushed a lock of ebony hair from her eyes and continued reading a sign which read as follows "The ONLY way to Yosemite Valley is via Yosemite Valley railroad from Merced. No more hot and dusty two-day stage rides. Only nine hours by rail from San Francisco and 16 hours from Los Angeles. A smooth and dustless roadbed roadbed winding through the panoramic Merced river canyon for nearly 60 miles. Fine observation cars. Round trip by rail and stage, $18.50"
As Jean glanced down at the seat beside her, she realized that her purse was missing. A swift movement caught her eye and she turned toward the door in time to see a brown-haired woman disappear into the pullman car. Without hesitation, Jean quickly hurried after the woman. She caught up to her in the middle of the pullman car. As she took hold of the woman's arm, Jean spoke in a quiet voice "Excuse me, but I believe you have my purse." Before the woman could reply, there was tremendous thunder-like noise, and the piercing screams of people in agony could be heard. Both women dashed to the window of the pullman car and saw that the baggage car and day coach, from which Jean had just come, had broken away and had gone into the Merced river! Immediately they pitched in a helped with the ones who were hurt and not dead, for several were killed. While going home from Bagby to the Mt. King Mine on a hand car Friday last, John Castagnetto of Mariposa narrowly escaped death when a logging train on the Y.V.R.R. struck the car on which he was riding. Before leaving Bagby, Castagnetto was informed that the track was clear and did not notice the coming train until it was almost upon him. He escaped by jumping from the car. The hand car was wrecked. On Monday evening as the freight crew was switching at Barite, a car of waste rock broke loose and ran wild, down the main line for two miles before it left the rails and crashed into the Merced river. Frank Sayers and Ed Bunnell were on the car and worked frantically to control it with hand brakes. Seeing it was completely out of control they jumped to save their lives. A passing motorist on the All-Year Highway checked the speed and found it to be 60 miles an hour. Section crews repaired the track and train service was not delayed. When President Franklin D. Roosevelt visited the Yosemite National Park the Presidential planers were prepared for the Presidents train to be routed from Merced to Yosemite, thence through the park and reach the "high iron" railroad at Fresno. Of coarse the plans were changed once they discovered that railroads were not allowed in a National Park. Al Rose of coarse, said there is no way to varify this tale. Knowing how bureaucrats stumble some times - it does sound plausible.